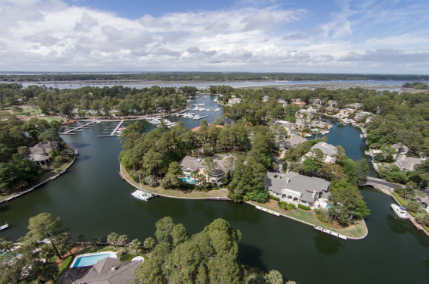 Wexford’s 37.5 acres of waterfront and 138 slip harbour offers direct access to the intercostal waterway and Broad Creek. You can get a slip or park your boat in your backyard. There are only two other communities on the east coast with lock-controlled harbors. Wexford has 500 acres with 37 acres of waterfront winding through the residential neighborhoods. By design, every home has a view of marsh, lagoon, golf course or harbour.